Built-In Safeguards:Benefit from a safer charge with a premium circuitry that will prevent overheating, overcharging, and short-circuit. Stop underpowering your devices with battery-saver modes and performance under-clocking tricks. Exploit your devices full potential and simply charge them back up when the battery runs low. 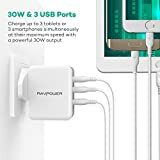 Bring this charger always with you without adding any weight or bulk to your purse or pockets thanks to its lightweight and compact construction that's nothing short of amazing.